Recent news on the situation of the South African metropolis Cape Town underlines the gravity of drought as one of the most destructive environmental disasters the world faces today. Still, we do have the data, the processing power and the analysis tools to monitor the situation day by day. Let’s start using these to the fullest, not only for European but for global emergencies that are on the rise. Cape Town, South Africa is facing fearful times as the metropolis is on the verge of running out of water. Due to the severe drought people are forced to limit their water consumption to a minimum, by flushing the toilet as little as possible, recycling shower water, etc. If there’s no rain any time soon, the government will close the water tap and people will have to collect water from one of the collection points throughout the city. But facing the most dreadful drought in more than 100 years, the Western Cape reservoirs don’t even hold 20 % of their capacity. It is needless to say Cape Town inhabitants are anxiously waiting for the rain season to start. Why wait when we have massive amounts of data? A lot of people are wondering why the government has waited so long to take actions. Especially since there hasn’t been a normal rain season for the past three years, so problems were bound to happen. We already use various kinds of data sets to predict risks and take actions in time. But then how can we improve local and global risk management? 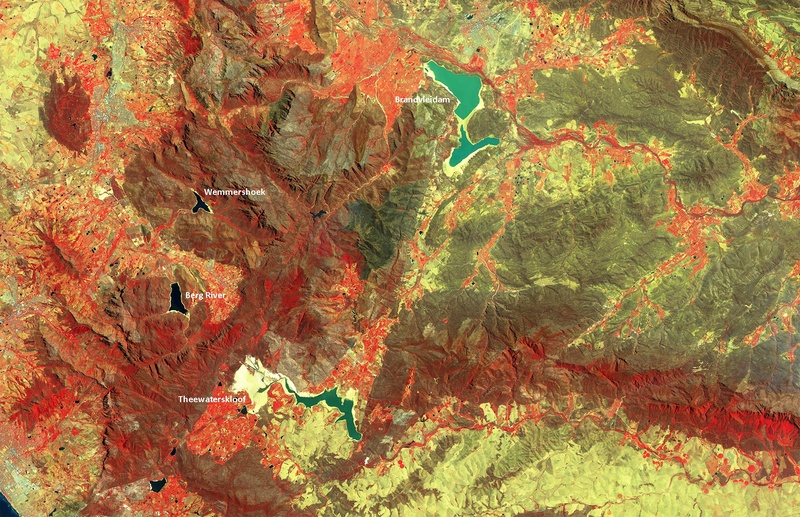 A huge amount of remote sensing data is freely and easily available. Copernicus’ (Europe’s Earth Observation programme) satellites deliver free and open data every day. Data which contain invaluable information about our environment so we can safeguard our livelihoods. Together with Copernicus for a circular economy? Thanks to all the Earth observation data we can derive information products. The vegetation condition index, Fraction of green vegetation cover and Water Bodies, to name only a few information products, are provided by the Copernicus Global Land Service. 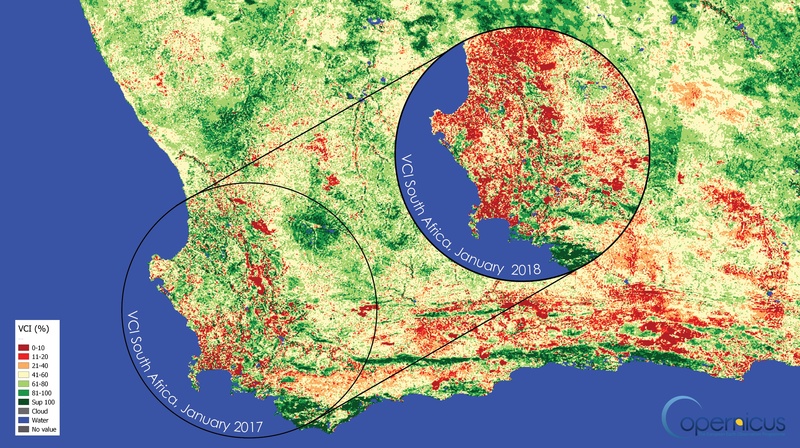 Vegetation Condition Index (VCI) products of the Copernicus Global Land Service show an increase in severe drought around Cape Town, going from 23% to 35%. Some users already are on board and actively use this kind of information to warn about disasters having a devastating humanitarian impact. Action contre la Faim (ACF) coordinates services to monitor the resources of cattle herders, ESA sets up programmes to support food security from space, the Food and Agricultural Organization of the United Nations (FAO) offers tools on the monitoring of water use in agriculture, and many more. With research projects, programmes and operational tools and services like these we want and truly need to optimize the use of our Earth’s natural resources to support, protect and serve the governments, public authorities, industries and of course us people in the end. 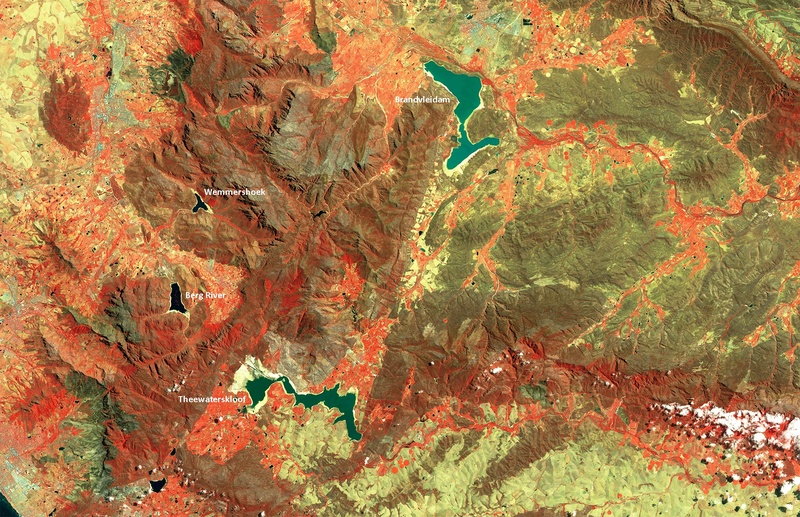 Sentinel-2 Images of Cape Town, South Africa on 31 January 2017 (above) and 16 January 2018 (below).